BD: Thank you for taking time out to speak to Bluesdoodles this afternoon. Another digital experience to add to the bucket list – first conversation using Facebook Messenger. With Special Guest slots on two UK Tours and a new live album, you must be excited and busy. Before we talk about the here and now let’s find out a bit about Steve Hill and why he became a one-man band with a difference. BD: What were your first musical influences growing up in Trois-Revieres near Montreal Canada? SH: Always loved music. I never thought that I would become a musician. My big brother listened to hard rock etc. First song I remember, I was about four, was Cheap Trick’s Dream Police. Then ZZ Top’s Eliminator album and AC/DC all were played and are big favourites of mine. It was Brothers in Arms by Dire Straits that I first heard the guitar sing and I thought I really want to do that. I was in year 12 and started to listen to Cream, Hendrix, Zep it was 1986 and not into pop and hairband music of the times. My friend’s big brother had all the good British Rock of the 60’s & 70’s in his collection I heard Sunshine of Your Love and I knew I gotta do that. A friend had electric guitar another played drums. All of a sudden it felt that it was possible. Then I was shown the riff to Pink Floyd’s Interstellar Overdrive from the Sid Barrett era. Then learnt the E Chord and still playing that chord I keep it basic. Started playing the guitar at 13 and by the time I was 15 years old I was in a band. By the time I turned 18 I was a professional musician and that was 25 years ago. The live album that is out soon is my tenth album, the first was released back in 1997. I played lots of gigs and went through a dark period. Then with Solo Records Vol 1, it all changed. I became a one-man band and it seemed to work just fine people enjoyed the thing and I have notched up 800 shows in the last 6 years. Playing solo I found my sound through being limited by being a one-man band. BD: When you were in the band as a young man did you ever imagine or see yourself as a multi-instrumentalist? SH: No. When I was younger I saw myself as a guitarist in a band, I was happy being the guitarist. Then the singer left the band when I was 17 or 18 I took over singing duties. Back then never thought about becoming a one-man band; happy being in a band producing records. What I now have is a band where I am in control of what can go wrong. A bit like skateboarding which I love could kill myself this makes you really focused on the task at hand. BD: You have re-defined people’s perceptions of one-man bands, with your compelling mix of hard rock, stinging guitar and blues so dark it’s falling out of the sky. Have you always been a One-man band or have you progressed to this format having played in a band? SH: I hand the cymbals, have two feet for the drums and also bass and guitar. There are no jazz chords which is definitely a good thing! The limitations of the kit make the foundation and keep the sound more basic. I love the blues especially Chicago Howlin Wolf, Muddy Waters, the sound has simple foundation it is their interpretation of the music that makes it fantastic. Rock bands such as AC/DC have simple and so powerful. Best part of being a one-man band not being in a silo. My solo kit is a bass & snare drum, hi-hat and cymbal. Be stupid to have three bass drums when playing on two legs! I play standing up. Why? Simple when I was guitarist/singer in a band for a long time I played standing up I feel more comfortable. When I started out solo it was my guitar voice and foot stomping the bass drum. I have tried sitting but it just didn’t feel right. . I thought I could include the other leg, so I learnt to keep my balance and be able to stand on my heels for two hours every night. It is physically challenging. I found that just bass drum and hi-hat was boring I love rock n’ roll and you need a backbeat so got a snare drum with a pedal. But I needed a Hi-hat. How do you do that I thought? A drumstick in the guitar headstock to hit the hi-hat! A few broken headstocks and then it was working fine. My guitars are modified to be able to play the bass lines with my thumb. On the thicker strings, I have an extra pick-up through an Octaver guitar pedal, input signal from the guitar is now one octave deeper and through a Fender bass amp. I play guitar fingerstyle like Hubert Sumlin, I played with him what a thrill that was this allows me to play bass and lead at the same time, just have to keep it all together and not fall down (laughing) You have to be able to split your head into six parts. I have always been used to singing and playing at the same time. Important to keep the tempo going When it all comes together it is rather amazing. Took me a long time to become a drummer and not just hitting the bass. BD: Your songs have a great narrative that builds through the lyrics and is augmented by your instrumentation whether the blues harp or guitar. How do you approach your song-writing is it story first melody after? SH: Bit of both really. I record a lot of riffs on my phone, I went through them last week as I am changing phones. There were 150 song ideas from last year, most will not be used! The other times the song builds from a lyric I write and hear the melody and chords other times riff first and add lyrics later. The best songs it all comes at the same time. I play the melody and singing random lyrics. Writing songs is a bit like a jigsaw puzzle. Records the song then fill in the holes. In some ways the song exists even though it has never been played, you get most of the pieces, a few lines that tell the story you then have to finish it. Writing songs is quite crazy never exactly the same, it just happens. It is hard work you may work for three or more days on it or it won’t happen. Then you get this like which leads to a killer song. Lyrics are really important. BD: New album is a live recording. The One Man Blues Rock Band, the album demonstrates your musical dexterity. What made you decide that this your latest album would be recorded live rather than in a studio.? SH: I have wanted to do a live album for years. I play live in the studio when recording but have never been satisfied. The set I recorded this time is really good. I liked the sound it was good. The previous 3 solo recording albums are not where the one man band is today. With new markets in UK & Europe, I thought it could be a nice way to get audiences to know my sound, this album really represents what I do better. This is the material you hear when I play live, now it is all about doing concerts, there is not really a music business anymore. It is difficult to get the energy even though it is all recorded live in the studio, never sounds as good as when you play the 500 live shows. This new album is really good, well recorded and really represents what I do. Check out the Tour dates and links to Tickets NOW! 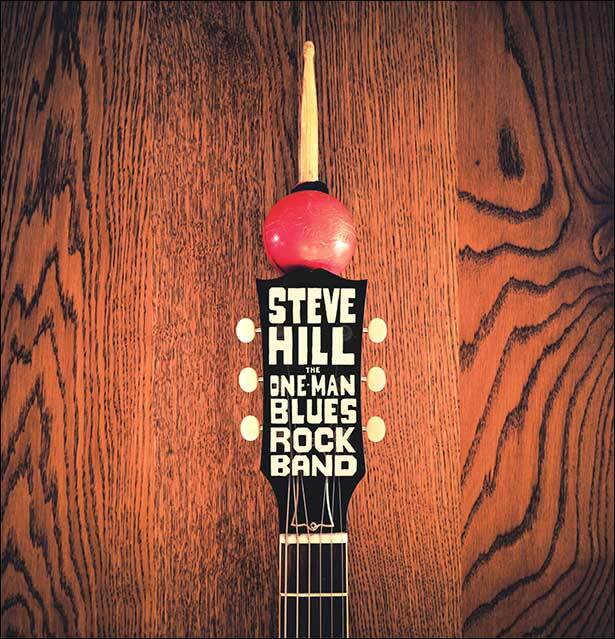 BD: Well, we might not be seeing that band on tour but you can see the phenomenon that is Steve Hill One-Man in UK this May as he opens for King King and Danny Bryant.